A warm aloha from the island of Maui! Welcome to our website where you’ll find affordable and competitive prices for Maui Hawaii destination wedding packages for getting married in Hawaii, Maui beach weddings, and Hawaii vow renewal ceremony packages! Thank you so much for taking the time to consider Maui Weddings From The Heart as your Maui wedding planner to assist you with the planning of your Maui Hawaii beach wedding or vow renewal ceremony. We offer affordable Maui Hawaii wedding packages and Maui Hawaii vow renewal ceremony packages for both Hawaii beach weddings and private venue weddings. If you’ve been researching Maui wedding planners online, I’m sure you’re feeling pretty overwhelmed by now. There’s so much information that it’s hard to keep it all straight. We are here to make your life much easier and your wedding planning simple and enjoyable. Just give us a call for a free initial phone consultation, and we’ll be happy to email you a free proposal within one business day of your request. Just complete our online reservation form and let us know what services you are interested in and we’ll put together the most economical custom package for you. Our wedding and vow renewal packages are very reasonably and competitively priced. We aren’t a wedding mill. We take a limited number of weddings each month in order to provide you with personalized and attentive service. The cheapest wedding companies do upwards of 30-60 weddings per month, which can cause burnout. Our volume is much less, so you can be assured that your wedding will be given the special attention that it deserves. I work with the greatest team of professionals who put their heart and soul into providing the best services possible for a wedding experience that we hope will surpass your expectations. Most couples are pleasantly surprised at how comfortable our vendors make them feel, and how friendly, fun and professional they all are. And our officiants are carefully chosen for their warm, heartfelt ceremonies. You can read some about some of their experiences in our online reviews. We also proudly offer Maui LGB T weddings, because to us, love is love, regardless of gender. 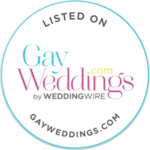 Our professional wedding vendors have been providing services for gay weddings for years. We specialize small, simple Maui beach weddings and vow renewal ceremonies. We also arrange garden and private venue weddings. Choose from our selection of affordable Maui wedding packages and vow renewal packages. Begin with the package that has everything you want, then add to it from our list of Maui Wedding Services. As owner of Maui Weddings From The Heart, I promise to make your Maui destination wedding planning easy, effortless, and enjoyable. I will guide and advise you on every important aspect of your wedding planning, from the best wedding venues for Maui beach weddings and garden weddings, to the best time of day to hold your wedding, to the type of musician, Maui wedding photography and videography, to wedding bouquets and décor. You can put your trust in my 26-plus years of experience in arranging destination weddings for couples from all over the world. Together with my team of dedicated team of professionals, you will have the beautiful, heartfelt wedding ceremony that will bring you fond memories for years to come. My promise to you is that I will be there every step of the way, providing information, suggestions, and recommendations to help you easily make the decisions for one of the most important days of your lives. So contact us today to begin planning the wedding of your dreams! A simple beach wedding with officiant and professional photographer only $575! >> see more "You did an absolutely fabulous job, from arranging our special event..."
"Aloha Shasta, Andrea, Pastor Joe, Frank and Derick, We just wanted to thank all of you guys for the beautiful wedding you organized for us! It was well beyond our dreams how well it all turned out! From the beautiful ceremony with Pastor Joe to the Beautiful Music Derick and his beautiful ukulele played. Special thanks to Andrea for the cove you got us on the beach! It was out of a story book! Frank our photographer was very easy and wonderful to work with! Frank was extremely creative also! There are not words to explain how beautiful it all came about. All of our guests that came out were so very impressed on how beautiful you all made it! We thank you from our hearts! "Aloha Shasta! We have to say you have totally surpassed our expectations on our wedding experience! It was so nice to be able to enjoy our stay and not have to worry about any details associated with the wedding. You were kind enough to make our appointment with the licensing agent and then we were able to relax until the big day and that was AWESOME! You recommended a fantastic location-it was perfect! Right on the beach with very few people. Private. It was exactly what we had in mind! Reverend Joe was fantastic! He seems to really love what he does & it showed so much in his ceremony. It felt authentic and really personalized just for us. At the end of the ceremony he gave us some printouts of what was said at the ceremony and it meant the world to us for him to take the time to do that! He was amazing and we will definitely never forget him! Frank was amazing as well. He took a ton of pics and we just received an email with all of them yesterday. He was kind enough to ask if we had anything in mind picture-wise that he hadn't taken yet. Asking our input was really nice! There is absolutely nothing we would have changed. It was an awesome experience and we would definitely recommend you to anyone getting married on Maui! We loved Maui and can't wait to return!